Lithium batteries have become the preferred energy source to power a wide variety of consumer goods ranging from mobile phones to children toys to e-bikes and passenger vehicles. Though widely used, most people are not aware that lithium batteries are dangerous goods and can pose a safety risk if not manufactured and prepared in accordance with applicable regulations. No rights can be derived from the information provided on the website. Are generally primary, non-rechargeable batteries that have lithium metal or lithium compounds as an anode. These batteries feature a higher energy density than the conventional alkaline batteries. Lithium metal batteries are used to power all kind of devices or are used as back-up power. Are a type of secondary (rechargeable) battery commonly used in consumer electronics. This category also includes Lithium polymer batteries. Due to the fact that these batteries are rechargeable it is often used in all kind of consumer electronics. “Battery” means two or more cells which are electrically connected together and fitted with devices necessary for use, for example, case, terminals, marking and protective devices. A “cell” is a single encased electrochemical unit (one positive and one negative electrode) with a voltage differential across its two terminals. “Cell” means a single encased electrochemical unit (one positive and one negative electrode) which exhibits a voltage differential across its two terminals. 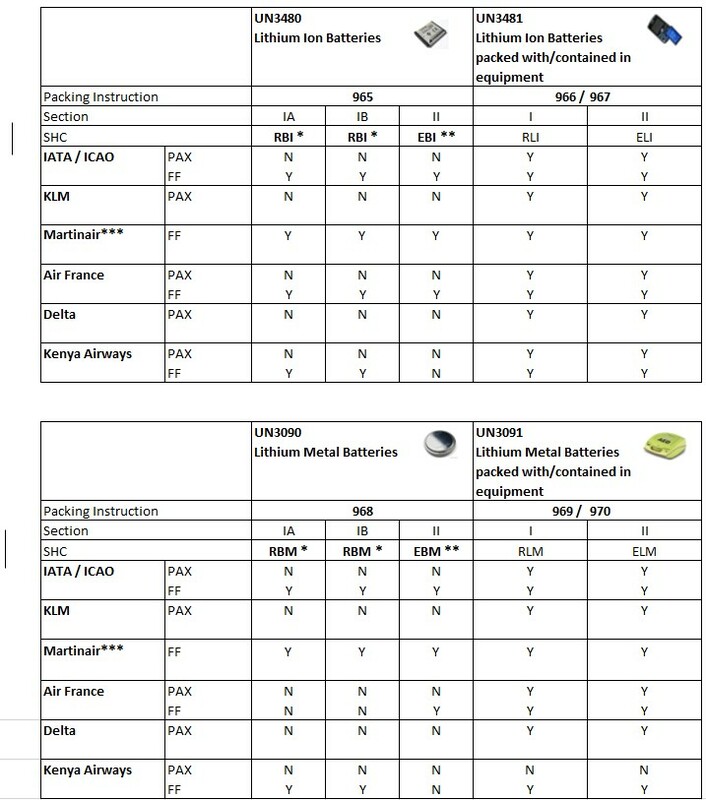 According IATA.ICAO regulations a encased electrochemical unit is always regarded as a cell and not a battery regardless whether the unit is termed a “battery” or a “single cell battery” outside DG regulations. Lithium batteries may be subject to a so called “thermal runaway.” This occurs when the internal circuitry is compromised, causing an increase in temperature in one or more of the cells. The heat can reach a point where the cells vent hot gasses, which can then increase the temperature in neighboring cells until there is ignition and a fire. In short; because of the tendency of lithium batteries to ignite and burn violently when exposed to heat or fire, large quantities of batteries pose a significant risk to the safety of an aircraft. A shipment of lithium batteries can intensify the severity of a fire considerably and a relatively small incident can lead to an uncontrolled fire. Lithium-Ion operated devices: smart phones, tablets, laptops, electronic cigarettes, drones, camera´s, filming equipment, electrical tools, medical equipment, self-balancing devices. Lithium Metal operated devices: watches, pacemakers, remote control, hearing aids, calculators, remote car lock. Note: Packages and overpacks of lithium ion batteries prepared in accordance with the provisions of Section II must be offered to the operator separately from cargo which is not subject to these regulations and must not be loaded into a unit load device before being offered to the operator. For more information on how to make a correct booking please contact your local CSO office by clicking on contact on the AFKLMP website. Lithium batteries must always be properly declared. The declared information is essential for correct transport and handling, notification to captain and proper actions in case of incidents. The information regarding Section I, IA and IB must be declared on a “Shipper´s declaration for dangerous goods”. Section II information must be indicated in the “Nature and Quantity of Goods” box on the Air Waybill. *UN 3480 and UN 3090 must not be packed in the same outer packaging with dangerous goods classified in Class 1 (explosives) other than Division 1.4S, Division 2.1 (flammable gases), Class 3 (flammable liquids), Division 4.1 (flammable solids) or Division 5.1 (oxidizers). **UN 3480 and UN 3090 Section II must not be packed in the same outer packaging with other dangerous goods. ***UN 3090 Lithium metal batteries (packing instruction 968) and Lithium ion batteries (packing instruction 965) packed in accordance with Section IA, IB or Section II shall be loaded on the 4 aft lower deck positions only (maximum of 160 cms high and a maximum 1000 kgs per lower deck position ), and are prohibited for carriage on the main deck, the forward lower deck and the bulk compartment. • 4000kgs per aircraft (in AFT lower deck compartment only!). One of the major risks associated with the transport of batteries and battery-powered equipment is short-circuit of the battery as a result of the battery terminals coming into contact with other batteries, metal objects, or conductive surfaces. Packaged batteries or cells must be separated in a way to prevent short circuits and damage to terminals. They must be packed in a strong outer packaging or be contained in equipment. For specific packing instructions always consult the applicable packing instructions in the IATA DGR. Note: do not ship damaged, defective, leaking or recalled batteries by aircraft! Damaged packages containing lithium batteries are not permitted to be shipped by air even if they are repacked! In order to identify packages containing lithium batteries it is essential to label them as specified in IATA DGR. Please check the current dangerous goods regulations or the lithium battery guidance document on IATA for more extensive information on required documentation per shipment and possible restrictions. As a precaution lithium ion batteries UN3480 must be shipped at a State of Charge (SoC) not exceeding 30% or their rated capacity.